I am an avid vegetable gardener, you can really tell when you pick some fresh sweetcorn and cook it straight away, the difference between fresh grown and supermarket aged. We have respect for gardeners of all types and that’s why we take so much care in restoring your yard to as near as pristine as possible after doing a perimeter treatment. There is nothing like the shrill call of Lorikeets summoning their fellows to a Banksia banquet. Unfortunately, there is one group of plants that we have no time for. They are an invasive pest that throttle other plants and steal their moisture. They are they bane of Brisbane garden maintenence. They also can actively aid and abett termites by forcing entry points open where there were none before. 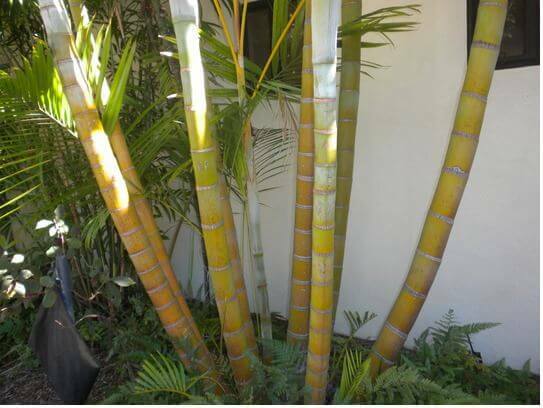 I am talking about palms, particularly golden cane palms. It looks innocent enough at the nursery, a sweet little sapling that could add a little tropical feel. Dont be fooled, dont bring home this monster. It’ll grow and grow vigorously, soon you’ll be spending your Saturday picking up discarded palm fronds. Just wait for fruiting season when the fruit bats come, and dont leave the white sheets outside when they are around (found this out the hard way, there is a mango over the back fence). Underground the real problem is occuring (at least as far as we’re are concerned). Palm tree root matting is incredibly invasive. As they hit the solid structure of the house wall, they tend to grow along it. Soon it will be an impenatrable mat that protects termites and creates entry points. The roots grow along mortar lines in the brickwork and as they swell gaps are forces open between the bricks. Never ones to turn down a free meal, termites are happy to exploit any new opportunities. Palm tree root systems also frequently crush water pipes when they are ceramic or PVC. Even when you’ve had enough of fruit bat droppings and collecting fronds and you cut the thing down, the stump persists forever. Termites are just as happy nesting in a palm stump as they are in a eucalypt or pine. Long after the plant is dead its serpentine root system will remain, now an edible path straight to the wall. Rule 1: If its a palm, get rid of it (particularly if its within 5m of the house). Rule 2: Dont plant it. Think about all the maintenence, and how it will throttle everything (including water pipes) within its vicinity. Rule 3: If you absolutely must have a palm (I cant think of a good enough reason why) then plant it AT LEAST 10m away from anything you care about, especially the house. 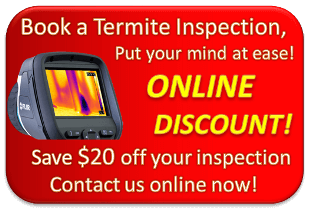 Call the Termite Guys at any time for free quotes or for a termite inspection!